Countless times I’ve been in a meeting, a standup, walked over to someone’s desk, overheard someone talking, or witnessed a conversation in Flowdock (our chat app) and it’s lead me to need to file a story in JIRA to cover the thing that needs to be done. Logging into JIRA and creating a new issue from scratch or cloning an issue is kind of tedious. Bee is native Mac application which I have set up so that when I press Shift+Cmd+Space, a Quick Add JIRA screen comes up and I can easily capture the fields and file it. It nearly instantly generates me the Issue Key so that I can send a link to the JIRA in whoever needs it, or just keep it in my backlog. This has had HUGE impact for me because instead of writing things down in some memo pad or Evernote entry I may not come back to or forget about, I can immediately note issues for a future backlog and later come back and prioritize them when I have more time instead of forgetting about it. Bee costs about $30 USD, but I’ve expensed it and I think it’s absolutely worth it. If you don’t use JIRA, Bee has integration with GitHub and FogBugz. The Mac’s native screenshot tool is great for quickly capturing images. However annotating that screenshot with arrows or notes has long been a pain. I’d have to open the image in Paint or another tool, edit, then save. 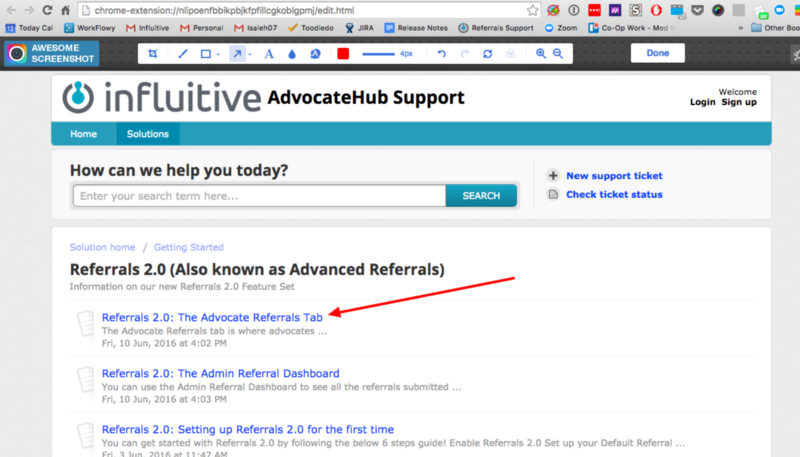 With the Awesome Screenshot chrome extension I can instantly add a red arrow, to much more easily point to what I’m talking about in an email to a user/customer, or in a help article I put in our Knowledge base. I now use this even when I’m communicating with my family to make things ULTRA clear. It saves me having to type things like “click on the button in the bottom left that says Confirm.” I can now just say “click this button” and add an arrow. Voila! 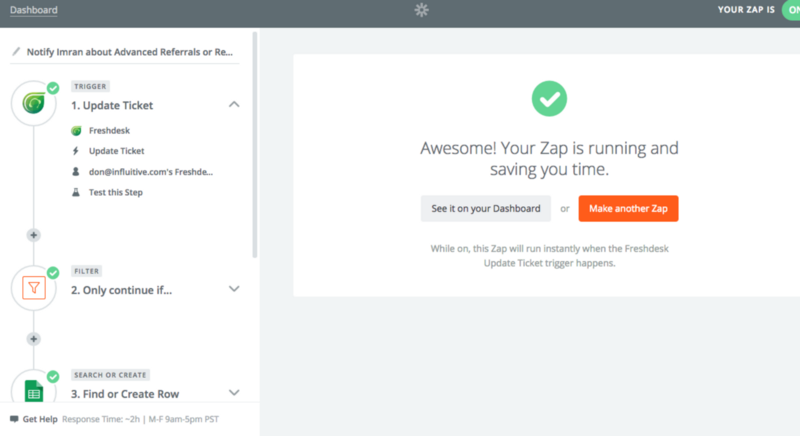 I could probably write a whole article just on my use of Zapier. I use it to remind my team about cleaning up the JIRA board once a week. We also used the Zapier Webhooks functionality to to some end-to-end testing of our Public API integrations with outside applications like Shopify. One of the best Zaps I’ve created is one that logs all support tickets tagged as “Reports” or “Referrals” (the two features I’m the lead Product Manager for) in a Google spreadsheet, and then notifies me after 24 hours, so I can see what the issue was. I rely on our support team to help triage and answer tickets, and they will always escalate to me if needed. However, even in times when they don’t need my input, its useful for me as a Product Manager to see what’s causing our customers to complain or what they are noticing. That way it helps me sanity check what I’m doing. I try to review these tickets once a week, to see if there are any learnings, and update my planning accordingly. One of the things I like about being a Product Manager is the regular cadence, rhythm, and repeatability of the development process. Each cycle you can get better at what you do and at anticipating things. At Influitive, we have 2 week dev sprints. We have a planning meeting and a grooming (pre-planning we call it) meeting on alternate Tuesdays. Retrospectives every 2 weeks on a Monday. And Release notes emailed to clients every 2 weeks on a Wednesday. 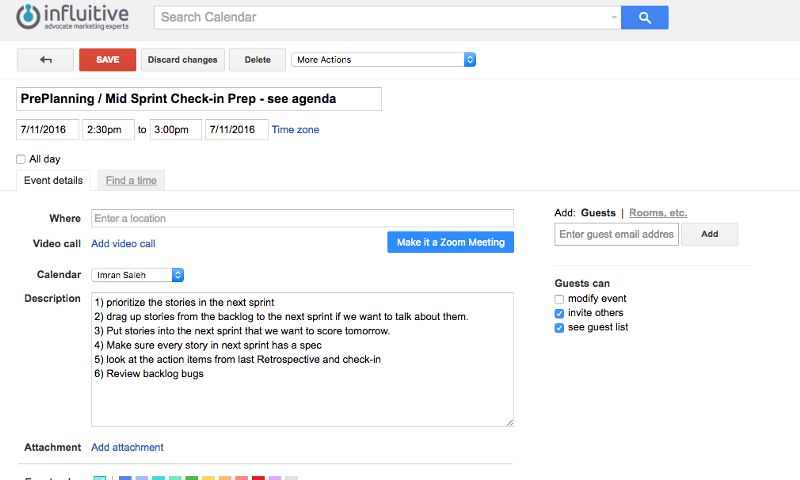 Drag up stories from the backlog to the next sprint if we want to talk about them. Put stories into the next sprint that we want to score tomorrow. 5. 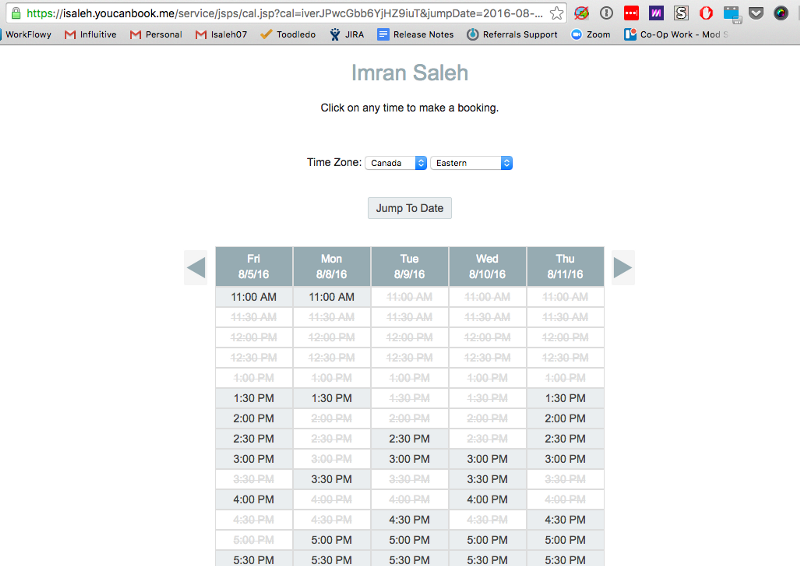 Having customers schedule time with me at youcanbook.me and have it automatically send calendar invites. I have my own Free youcanbook.me URL where if I need to schedule a meeting with someone outside of the company (A customer, a partner), I can just send them a link and tell them to pick the time that works. I have it set up so as soon as they pick a time, I get an email, they get an email, and a calendar invite is sent out blocking that time. This saves me from having to do a back and forth dance, adjust for timezones, remember to send a calendar invite, etc. It’s all done for me. Another alternative is calendly.com but that costs money. I like to leave my laptop at work so I don’t have to carry it or worry about it getting stolen if I stop somewhere on the way back home. 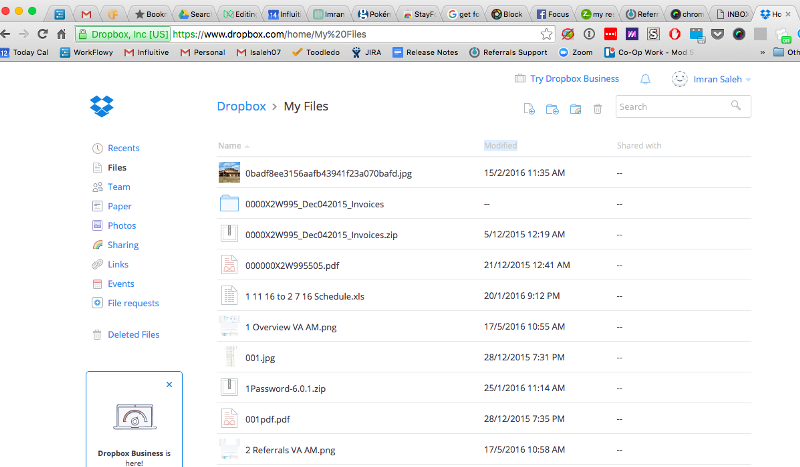 To ensure I can pick up right where I left off, I have Dropbox sync my files so that I can pick up where I left out. My strategy is to have all of my email attachments, downloads, and desktop files go by default to a “My Files” directory on Dropbox. You can choose where downloads and attachments are stored, but you can’t move your desktop into Dropbox. However, per lifehacker you can symlink your desktop to a folder in your dropbox. That way it will sync. Problem solved! Now almost any file I save on my work laptop will be synced to my home laptop. I also use Google Docs for spreadsheets and Simplenote for note taking which automatically sync as well. So it allows me to really be anywhere and feel like I’m at work! It’s really easy to get bombarded by notifications coming in from Email during the day. 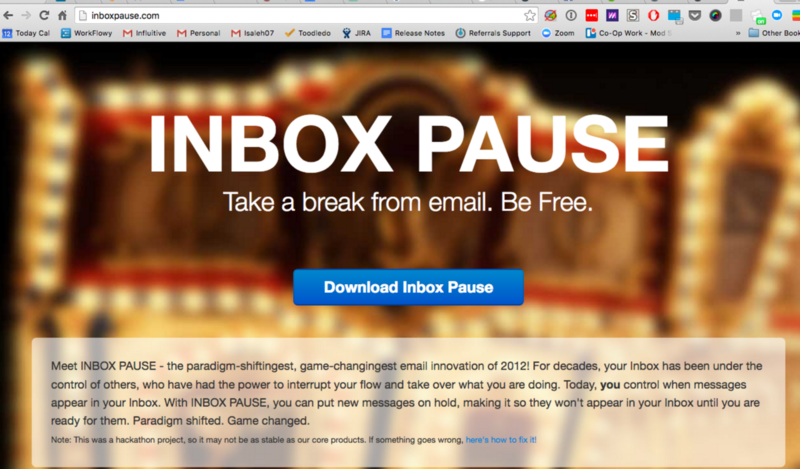 Using InboxPause I basically prevent myself from automatically seeing new email in my inbox until 4:30PM. I can still search for an individual subject or message, or manually unpause if I would like. But it limits those urges just to sit on inbox and click refresh and wait for work to come. It forces me to be a bit more proactive. Similar to above, sometimes its too easy to just have a free moment, type facebook.com and suddenly 10 minutes are gone and focus is lost. 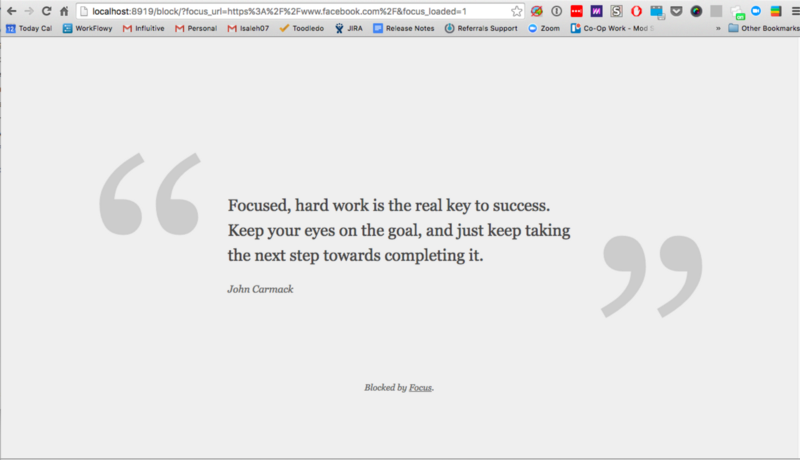 I personally use Hey Focus but also StayFocused has been a good Chrome Extension that I’ve used in the past. It auto populates a list of common distracting sites, and then I can add my own. If I try to visit a blacklisted site, it blocks me and reminds me that is blocked with a motivational quote. Sometimes just that one barrier can be all it takes to prevent me from getting sidetracked. 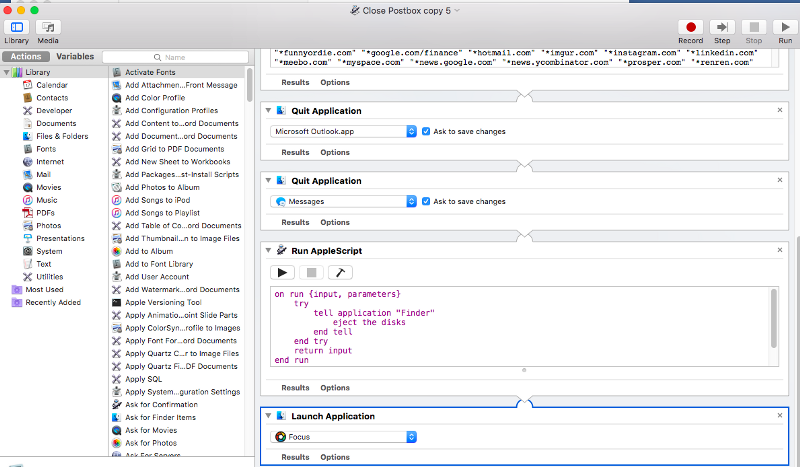 Mac Automator is a great tool I have for reinforcing habits. You can write an automator script and then have it run at certain times of the day using the calendar feature. I have automator scripts to close my open browser windows and applications to remind me to go to bed or leave the office. I also have an Automator script to re-activate my HeyFocus distraction blocker from above, incase I unpause it over lunchtime and forget to re-enable it, so I don’t mistakenly leave the flood gates open. I often schedule emails that I write late at night to be sent around 10AM the next morning, when people in the company are more likely to read them. This helps me get it out of my system and finish the task say at 9PM at night, but then have it go out at an optimal time for others to read it. I also do this to let people know I’m on vacation. Usually I’m rushing around the day of vacation, so scheduling a reminder that “today is the last day I’m in office” allows me one more thing to free off my mind. 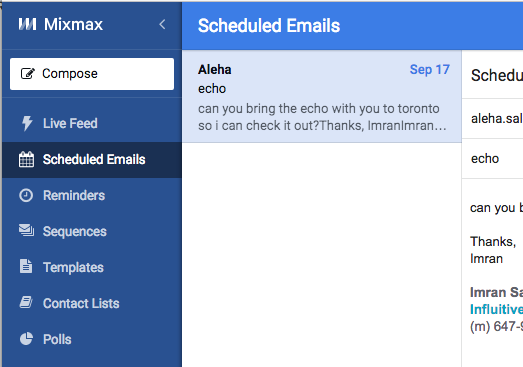 I can also use Mixmax to track if an email has been read/opened. Sometimes when people haven’t replied I’m not sure if they got it. The read rates give me that confidence that it has been processed, even if someone hasn’t responded. Well those are some of my best tips! I would love to hear your thoughts in the comments as well other tricks you might have that I missed! I’m sure I’ll have another edition of 10 ready in a few months, so stay tuned. If you’re interested, follow me and you’ll get a notification when I post with the next batch.